Both the Temple and the Stanford games proved to be very different games for Jahlil Okafor, but he still found a way to contribute to the wins. Do you think this is an indication of things to come from competitors ??? Well, we all are familiar with the Marine Corps motto: “Improvise, Adapt, and Overcome.” This is an excellent example of what “Oaks” will need to embrace each and every time out, and he’s done so thus far. Some coaches will double-team him, some will revert to the “Hack a Shaq” and test his performance from the Charity Stripe, and others will try something else we have not yet identified. He was never destined to shoot 85% for long, but his impact is unquestionable. I continue to be impressed !!! Well the scouting report is in, especially after the Michigan State game. We have always said between ourselves “lets wait and see” when it comes to Freshmen, so guess what ? The competition is saying that too. Now they know how to play him. Make him fight for position, deny him the ball, take it to him on Offense. The busier he is the more likely he is to make mistakes. There is an expected adjustment period for Freshmen, this is the time for Okafor to really find his bearings. Playing Temple and Stanford back-to-back was a real test for the Freshman. Quinn Cook brought his “A” game in all these games, which garnered him the MVP of the “Coaches vs. Cancer” event. Do you think he hass finally found the consistency he has had some problems with in the past ??? I think his play has been impressive, but I think much of his success has been due to his blending with Tyus and Rasheed in the BackCourt, and benefitting from dishes from the FrontCourt. He has found plenty of open space for uncontested strokes and made plenty of them. He’s shooting 54% and 49% from outside the Arch !!! After the Stanford game he said that he likes the leadership role he has been given, and believes he is just taking his place amongst those Duke players that went before him. That indicates his mind is in the right place. Time will tell, but he’s looking like the real deal now !!! I am loving Cook’s leadership. He is playing great. He leads the team in scoring, plus the shooting numbers are awesome, even if he is shooting by himself in the gym, those numbers are still great. In my in profile on Cook I discussed how throughout the previous three seasons, he has always played well in November and December. We are still in November. It is his Senior season and I want to believe that he can keep this up for the next four months. What statistic(s) from these games this weekend impressed you the most ??? Without a doubt, I am head-over-heels at the way Duke is grabbing Offensive Rebounds. They are getting great put-backs and 2nd chances with a new Shot Clock. This pays plenty of premiums in every game and often catches the Defense off guard for a Trifecta. I also love Duke’s perimeter Defense. They are consistently causing TurnOvers, resulting in breakaway transitional Points. Tyus Jones came back to earth this weekend, with an 0-for-6 outing against Stanford and 1-for-7 against Temple, but he found other ways to contribute. He leads the team in Assists, makes two Steals a game, and more importantly he takes care of the ball only turning it over once every game. As a whole Duke turns the ball over less than ten (9.6 to be exact) times a game. Compared to the other ACC teams they are only second to Pittsburgh (9.3). Rebounding is improving but they are middle of the pact in the ACC. Now, that might be a testament to the level of competition. NC State is averaging 52 rebounds in three games, North Carolina just a hair under 50 in as many games. Duke is managing 39 per contest. I should note that they have only been out rebounded once, through five games, and that was against MSU. Who has most impressed you the most off the bench ??? I think that Matt Jones is benefiting from the expectations that he score. If you notice, he seems to own the Corner. He continues to excel on Defense. I’ve also been impressed with the quality minutes “PlumTree #3″ has provided. He has resisted the over eagerness to excel when he actually gets minutes. I’m curious about Grayson Allen. He finally got minutes and looked great against Temple, but did not see play against Stanford, along with Semi. Going forward, there will be nights when Coach K will need to go deep into his bench and not in the platoon style he seems to like to use as a twist. It makes sense to me to get the bench experienced before they are needed for a win. No doubt that Matt Jones is the most productive bench performer at the moment. I am impressed with Marshall Plumlee most though, I think at this point he is coming into himself. He knows his strength is Defense and plays to it. He also looks more relaxed on the Court. Coach K is quoted as saying that there is nothing Jahlil should be able to do eventually, but that he realizes that is might not happen while he is at Duke. Does that bother you ??? Rarely has a player impressed me like “Oaks” has. He reminds me of the best aspects of each of my favourite Centers of yesteryear. Against Stanford, I saw him throw a baseball pass fully extended from the baseline to half-court with just the flick of the wrist. His Rebounding has been exceptional, and I have yet to see him make a bad decision. I admit that I do not embrace the “one-and-done” player and believe that the NCAA has to do something to stop this trend. I detest the thought that Duke might become a revolving door like other programmes, even those of coaches I respect. I would be lying if I didn’t say I have heard the theories that Coach K has rationalized his stance on the “one-and-done” in the hopes of attaining another Championship before retiring. I’m still an ardent Duke fan nonetheless and will continue to hope for that change I believe needs to happen. We know Okafor will only be at Duke for a season, barring any unforeseen circumstances. It is not a stretch to imagine his best years are beyond Duke. He is by no means a finished product, so, why look so far ahead ? For one thing, Okafor is a “throw-back” player, back to when Forwards and Centers mainly did most of their damage five feet in front the hoop. We are in a time where Stretch Forwards and Centers are coveted. His type is a dying breed in the NBA, but with DeMarcus Cousins’ emergence this season, Okafor’s stock has taken a boost. Maybe Coach K was laying the foundation for his Freshman’s next gig. Coach K has surprised many by embracing the idea of platooning. We have postulated that it would not last, yet it continues, while not as much as previously. What do you make of this ??? I was impressed that Coach K might have gotten past his penchant for playing just 7-8 deep. I thought the idea of platoons was a hokie idea, possibly giving away the accomplishments of the Starters. All that optimism ended Saturday night, so not so fast. In the most consequential game thus far against Stanford, he reverted to 8 guys, and only 7 got double-digit minutes. That causes me to worry for Grayson and Semi, but maybe with the upcoming Furman and Army games, the “2nd Team” might get more floor time and chances to prove them worthy of time in bigger games. I am not sure how much Coach K has embraced platooning, whereby an entire starting five replaces the players on the court. At the moment only 3 bench players average double-digit minutes, and that statistic is obscured by the first two games of the season. As the level of competition increases Coach K relies on his Starters a lot more. Compare that to Kentucky who has 10 players averaging between 16 and 21 minutes. North Carolina has 9 players averaging between 14 and 21 minutes. Those are teams employing a platoon system. Coach K has slowly reverted to his trusted 8-man rotation. In the last game against Stanford, only Sulaimon and Matt Jones played significant minutes. The only other player that entered the game, Marshall Plumlee, played 5 minutes. Any good coach knows that you can’t go into every game with a set script, but by not giving certain Bench Players a chance means that there is no platoon system being employed here. I am OK with it because Quinn Cook is flourishing in his coach’s trust. I am not OK with it because Winslow is playing too much in November. I want to see if Ojeleye can play some meaningful minutes behind Justice. Since I am not at the practices, only Coach K knows why he makes the decisions he does. One more thing, the “platoon system” is John Calipari’s mantra for this season, as if he invented it. Roy Williams has been doing that for years. Both teams will likely still be undefeated and are very deep. What challenges are you anticipating for this Duke team ??? Bo Ryan is one of my all time favourite coaches in college basketball. His teams always represent the Big 10 well, and have shown Duke’s weaknesses in this event. The Badgers are deep and talented, with 4 players averaging big double-figures, while 8 guys are averaging double-digit minutes. The game is in Madison, which also favors Bo’s boys. The first challenge is this will be their first true road game. The second challenge is playing a higher ranked team. Wisconsin matches Duke incredibly well. Frank Kaminsky will be a heavy load for Okafor, because he is good inside and can shoot the Three. You can’t assign Jefferson to the seven footer to save the big Freshman from foul trouble. Amile he will have his hands full with Nigel Hayes, a double-double threat. Justice Winslow maybe a versatile defender, but on that night he will have to concentrate on Sam Dekker, a 6’9″ do-everything type. In the Backcourt, Coach K is going to have to make a decision. Josh Gasher is shooting 60% of his three pointers, through four games, and Traevon Jackson is a determined Point Guard that can penetrate at will. So, does Sulaimon or Jones start, or stick with Tyus Jones and Cook ? Indiana and Michigan have taken some very good teams to the Kohl Center and come back defeated and broken at the worst of times for Bo. Now he has one of his best and the most experienced teams in college basketball. Wisconsin wants to play Duke at home. They are not dreading this game but looking forward to it. Will the Freshmen stand and fight, or wilt under the spotlight ? For now, Duke should keep the focus on their next two games, maybe try to implement more of the bench. Wojo has just had a heartbreaking loss to an overlooked team that hasn’t been in D-1 for more than 5 years. I’m not saying that will happen to Duke, but that doesn’t mean they shouldn’t give due diligence to lesser ranked teams either. So there you have it !!! Don’t forget to send us your questions !!! 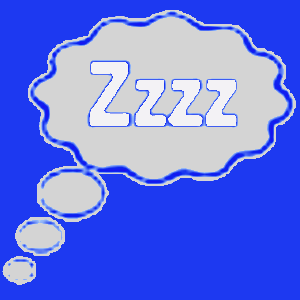 We believe that there are many folks who are doing a great job of reporting right after the games, so we thought it better to sleep on the games and give our insight after some further consideration. Today, Bermuda Bob shares his thoughts after a week that saw Duke win against Michigan State, Temple, and Stanford. I’ll admit it. Facing a Tom Izzo team always causes me to worry. He is one of the great coaches who always gets so much more from his kids. Couple that with Michigan State being Duke’s first REAL competition, I was more than a bit apprehensive. I was pleasantly impressed. For the record, I’m still not comfortable with such high profile events as this “Champions Classic.” I’d really love to see it just before the conference part of the season, or even in the middle of it. Of course, no one listens to me !!! As the Announcer asked the crowd of mostly Kentucky and Kansas fans there for the second game, to stand for the National Anthem, he found it necessary to add a request to remove hats. I was appalled that this had to be mentioned. Now, I admit I still get misty eyed during the National Anthem, but a direct request to uncover hit a very sensitive nerve. Thank you for allowing me that indulgence. Izzo decided to try and neutralize the down-side of double teaming Jalhil Okafor – who I have decided to nickname as simply “Oaks” – and it backfired. Duke struck with a balanced scoring attack with 4 of the 5 Starters in double figures. This offset Duke being out-rebounded 35-25. Duke played excellent defense, causing 13 TurnOvers and adding 6 Steals and 5 Blocks, all while staying out for serious Foul Trouble. The Bench contributed when called on sparingly, partly due to Rasheed being under the throes of the flu. An impressive outing that demonstrated that this team really plays well together. Next came Temple and Coach K’s old friend Fran Dunphy, who I was happy to see is growing back his trademark brush-style mustache. In recent years they have suffered from tough injuries to primary players. They always play tough nosed on both sides of the Court. Friday night was no difference !!! Every Duke fan of any length has lived thru those nights when the basket could be the size of wading pool and they could not score. This was one of those nights, plus Dunphy’s kids played a much more physical style than Duke had seen this year. They shot an abysmal 39% with only 30% from outside the Arc. Duke answered with a stellar defense both inside and on the perimeter. I was numb with pleasure !!! They caused 17 TurnOvers, adding 9 Steals and 5 Blocks but moreover, they hit the Offensive Boards like we haven’t seen in years !!! Duke led by 10 at the half and added another 10 to the spread. “Oaks” worked hard to score 16 Points on 7 of 20 shooting. On the other hand, Captain Quinn Cook continued to lead 17 points, as did Captain Amile with a great job on both Boards. Yup, this was a team that is playing complete basketball, and while it was a slog, they found the way to win even if it had to be a bit ugly. Everyone knows that Coach K never purposely schedules games against past players who are now coaching, so I was a bit surprised when it seemed a foregone conclusion that Duke would play Stanford, a team getting better each year under Johnny Dawkins tutelage. This game did not disappoint as Duke still only shot 39% and 36% from the Tre. Matt Jones added 10 points on deadly shooting, and Stanford allowed Quinn 21 shots alone. He hit practically every uncontested attempt. “Oaks” had another very physically challenging night. His opponent eventually Fouled Out, but not after seeing “Oaks” shoot only 4 of 12. On the other hand, he compensated tremendously with 12 Rebounds, 6 each on each side of the Court !!! I am ecstatic that Duke is hitting and winning the Offensive Boards like no team I can recall !!! As a team, thay logged 16 O/Boards and 25 D/Boards. You’ve got to love that !!! Once again the Defense forced 24 Fouls and 12 TurnOvers, while adding 9 Steals and 3 Blocks. It was a thing to behold for those of us who have lamented former squads who just didn’t execute Coach K’s call for hardnosed defensive performances. Duke led by 11 at the Half and ended up with that differential at the end of the game. It was obvious that Coach K was not interested in running up the score as Coach Dawkins was forced to go deep into his Bench due to Foul Trouble. In the end, Quinny was named MVP (I’m old school !!!) of the event, but that was easy. He scored and commanded this team with a wonderful aplomb. His job is to continue these performances. My take-away is that we are being taken for a magical ride as this team continues to mature with each game. Personally, I think it’s because this whole team seems to genuinely like each other. Now, don’t fall for all the blithering fawning people like those who commented on the games for TruTV. There will be tough days ahead, but this team seems to have a special way of making due with what is given to them by their opponents, even if it’s not particularly pretty. So Duke has had their first test of the season, Can you summarise what you have learned ??? The Good Stuff: Duke can count on Okafor to score at any time. Tyus Jones (no turnovers in 31 minutes) is a boss and Justice Winslow can get to the rim any time. Quinn Cook is really focused. As a whole, the team made 76% of their free throw attempts. Marshall Plumlee is growing up. Needs Work: Duke got out rebounded 35-25. MSU did a great job crashing the boards, even their guards got in on that action. Jahlil Okafor is susceptible to foul trouble. Good Stuff: I love the chemistry this team exhibits. Duke has been hurt every season since Kyre Irving, because the team was subverted to a kid who had no interest in being a team player. There is no indication that this exists. I credit the Upperclassmen and Coach Scheyer and Coach James who had them all summer long. Needs Work: I thought a few of the Fouls on Okafor were of the “ticky-tack” type. He’s going to have to expect that lesser opponents will try to lure him into such calls. I agree that rebounding is a concern, especially off the offense side of the court. Five (5) of their 25 Rebounds were on the offensive side. This means they need to concentrate on “boxing out” their opponent more instead of presuming every shot goes down. About 48% didn’t !!! The Freshmen are getting a lot of due credit, but what do you think of the Upperclassmen, and who amongst them stands out for you ??? Quinn Cook is doing great. Hopefully he can keep this up. Marshall Plumlee is a great defensive anchor. When Okafor went to the bench with foul trouble, Coach K went with Plumlee, Winslow, M. Jones, Cook, and Tyus Jones. They held MSU scoreless, extending a single-digit lead to a double-digit lead. Tyus Jones scored six (6) points during that stretch, but defensively, it was a team effort, and they rebounded well during that stretch. Shockingly, Marshall Plumlee only played nine (9) minutes the entire game but it seemed longer during the game. I was pleased to see Amile’s play. He is the benefactor of double-teams on Okafor. He stayed out of foul trouble and contributed four (5) Rebounds and a Blocked Shot in just 21 minutes. Quinny has been rock solid. He got open for good shots and led the team with 19 Points. He logged in six (6) Assists, a Steal, and no TurnOvers !!! That’s impressive, and a performance he ought to consider his standard. A wonderful standard it would be !!! Who else stood out ??? Coach K said Rasheed was sick as he had a flu virus and was throwing up all day. That’s why he was limited to 12 minutes but Matt Jones did OK. I would have liked to have seen more of Grayson Allen, who had about a minute in the second half, but I can’t say at whose expense. If Allen wants to crash the line-up, he and Semi Ojeleye have to be ready as soon as their feet touch the floor. Amile Jefferson was held in check even though he only had two fouls but I suspect Coach K didn’t want him picking up more fouls in case Okafor got disqualified. I’m sorry to hear about Rasheed being ill, but I’m strangely relieved because I wondered why he did not get more floor time. I like Matt Jones and hope that he continues to get solid minutes, giving him opportunities to contribute. He did an excellent job, even though his Box Score stats were unremarkable. I was concerned that Grayson and Semi didn’t get more time. I agree that they need to be ready to make an impact when they hit the floor, but let’s face it, they have to get more than what amounted to “stolen minutes” (3 between both of them). These guys can be impact players if they are given the chance. Both are tough nosed and capable of scoring, while not giving anything away on the defensive side of the Court. According to Mike DeCourcy, over at Sporting News, Coach k thinks that Jahlil Okafor has a chance to be better than Carlos Boozer or Elton Brand, two of the better post players during the Coach Krzyzyewski’s era at Duke, can you see this ??? Coach K clarified that Okafor is not iconic and he has to win to be iconic, so the bar is set very high against Boozer and Brand because one played in a Finals and the other won a Championship. Okafor is a blank slate, though, and is heading in the right direction. I think the first differential is that Okafor is a true Center where Boozer and Brand played back in the day where Coach K did not like to “pigeonhole” his players into positions. That was PC speak for the fact they were not traditional Centers. It’s a natural thing for all fans to try and liken new players to graduated favourites. I’ve compared Justise Winslow to Kyle, Lance, Shane, and Grant. I think that as the season continues and Okafor meets different opposition, he will distinguish himself in his own style. Let’s face it, Duke has only had one (1) other guy who played effectively with his back to the basket. That was “Zoubs” and we know how he and his teammates finished !!! Coach K also noted, in his on the Court post-game interview, that his players are evolving and that confidence comes thru experience. In essence, he’s telling us all to wait and see. I’m there with him because I think this year could be a wonder ride !!! In that same article, Mike DeCourcy wondered why Okafor doesn’t touch the ball more often on offense, because he is shooting a whopping 85%, and since he is a great passer that should be their point of attack. Do you think Okafor touches the ball enough ??? I like the inside-outside game, Post-and-Repost. They did that in the first two games but went away from that against MSU. Coach Tom Izzo was clever enough to realise that by doubling-down on Okafor he was leaving some lethal Three-point shooters with free shots. That’s why Duke surpassed 100 points in their first two games. I am happy with Okafor’s touches. Yes, he could touch the ball more on offense but that is lazy basketball. If Duke becomes accustomed to that style of play what will happen if Okafor is unavailable due to foul trouble again ? Duke has to let other players be themselves at times. Great teams do not rely on one player. Remember Jared Sullinger ? He was a dominant player until overuse, which led to injuries that slowed him down. The season is young so we don’t want to ride Okafor in November and December knowing that a tough ACC is looming ! I admit that I grew up with the great back-to-the-basket Centers. Wilt, Bill, Nate, and “Bells” to just name a few. I loved the dimension that “Zoubs” added to the offense as a “throw-back” Center. So, what makes a back-to-the-basket Center so effective is the double threat ??? It’s being able to dish to shooters but also to score. Yes, Okafor has an incredible shooting percentage right now, but if he does nothing but shoot he disrupts what makes him optimally effective – the dish. Personally, I’m exceedingly pleased with what I’ve seen in his play. I kinda wish some of the recent great shooters were still around to benefit from his dishes. In one of our previous installments, I noted that Quinn shot best when uncontested. Well, this game was yet another case for Quinn getting uncontested shots for lead the team in scoring. The bottom line is that “ … if it aint broke, don’t fix it …” !!! Any personal observations you might like to add ??? Sometimes in basketball, it is the action off the ball that sets up great plays. I love the way Okafor and Jefferson work together under the rim. Okafor can operate in any Post position he wants, but when Jefferson screens off his defender, the Freshman Reposts in prime position. Occasionally, Jefferson’s man rushes to double-team Okafor leaving Jefferson free for a layup or the offensive rebound. I’ve been impressed by how those double-teams on Okafor set up both Amile and Justise. Amile is never going to be a scoring sensation, but Justise makes the most of each and every “touch,” and so his Box Score will be more impressive. I tend to see little things that most don’t. I’m really impressed that these kids, especially Tyus, are comfortable using both hands. When I see guys making Lay-Ups with their weak hand, I’m happy as a clam. Last year, you could give Hood weak-hand shots because you knew he could not use his right hand to score. I’m not seeing anyone this year who has that impedance, and that converts to more fluid scoring and drawing fouls. Essentially keeping your body between the defense and the ball will always pay premiums !!! Remember to submit questions you want to have us address !!! Duke does not rebuild, they reload. Each year new faces lace up the “kicks” and prepare to make another run at a title. This strength also results in a weakness. An inevitable lack of experience and a constant learning curve, it is extremely important to have some sort of tenure. Amile Jefferson is arguably the best player that no one is talking about. Did you know that he led Duke with a .644 field goal percentage last season ? He was also second on the team in blocks and rebounds per game. No, he was not a monster. He did not haunt anyone’s dreams with worries of a 30+ point game. However, he filled the paint and played just as hard as anyone on the court each game. The Devils have the best recruiting class in the country and are poised for another huge year. Something more of an oddity these days, they will have experience everywhere. Amile will play a huge role for this team. Starting beside the Pre-Season Player of the Year in Jahlil Okafor, he will not be double-teamed. He will not be anyone’s focus. He simply will be a forgotten Post Man. That is, until he starts averaging a “double-double” each night. 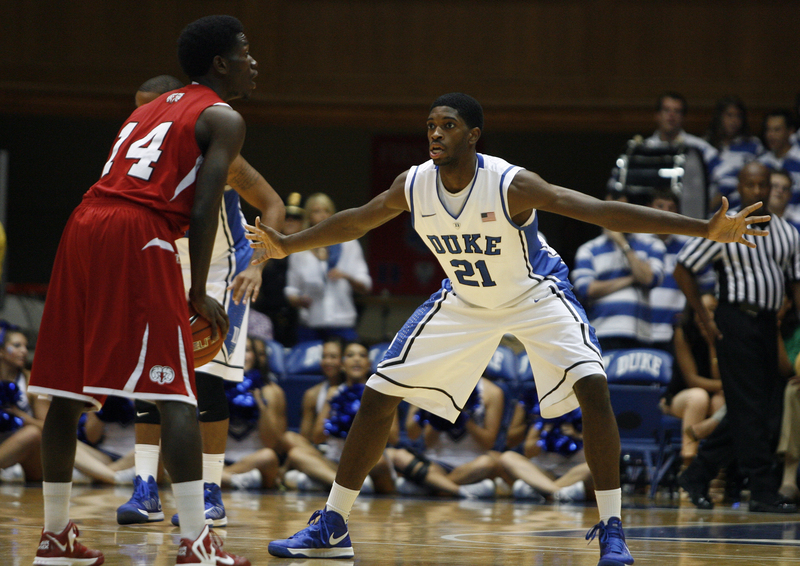 Amile Jefferson will bring experience to the Post. Almost fully recovered from hip surgery, he is getting stronger and quicker by the day. Although he will be the senior most returning starter to play in the Post this season at Duke, it is the new guys that will help him grow. Previously the student behind Ryan Kelly and Mason Plumlee, he will now use Okafor to open the Lane. As teams develop Game Plans to stop Okafor, it will open the Paint for Amile. Understanding his role, he will look to dominate the Glass on each side of the Court. He will be playing without the ball in his hand but making his shots count when he gets them. The typical Duke role player, he will look to continue possessions by pulling down rebounds and getting easy dunks as his man slides away for the double-team on Okafor. Additionally, as the ball is pushed through the Post, Duke will look to hit the open man on the perimeter. As they swing the ball around the outside, it will continue to open more shots for Amile. Both could result in big things for Duke. Okafor will be the focal point for Duke from the start. In one of the most odd statements in recent memory, Duke’s best player is a big man. That being said, the combination of Okafor, Jefferson, and Winslow will provide Post depth and athleticism like Duke hasn’t seen in some time. The best case scenario is that Okafor and Jefferson both average double digit in points, with Jefferson averaging close to 8-10 rebounds per game. Duke has struggled with quick Guards who can get to the Lane and score on an easy bucket. This will not be the case this year as there will be athletes in the way. An intelligent post player that will be hungry to deliver a banner to Duke, Amile will be a bright spot. When Coach K comes calling, you answer, and Coach K will make big things happen with Jefferson this season. Having posted on CBS Sports, TheACC, and Raycom, Curtis is an experienced writer than has been around the block a time or two. Stopping by on occasion, he is an old friend to SDBB. A Military Veteran of 15 years, husband, and father, you can follow him at https://www.tsu.co/curtisclontz. What was your biggest takeaway from the weekend ??? Duke won big over opponents that did not measure up. That may seem like a trivial point, but over the last few years, the Blue Devils have a tendency to play to the level of their opponents. I saw a very impressive bunch of kids who were very poised. I think that Coach K might actually have his most complete squad yet. By that I mean that they are cumulatively capable of completing his vision. They have so many different “looks” that they will be able to keep the competition on their heels all game long. They also look like they truly enjoy working with each other with none of what we’ve seen the past few seasons. Do you think he will go further than the 7-8 normal rotation, or will Coach K K employ Platoons like he did over the weekend ??? You learn nothing in a blow out. The true test will be against Michigan State on Tuesday night. Then we shall see where Coach K’s mindset for the season will be. Grayson Allen has surely forced his hand though. I see Sulaimon is being employed as a back-up Point Guard, but as the best perimeter defender he should get some burn when playing bigger back courts. We know Marshall Plumlee will be playing, come what may, because the front court is thin. Matt Jones has shown that he can be a knock down shooter. Semi Ojeleye still needs to work on his handles, or nerves, but his athleticism should help on the boards. I don’t think Platoons will be used that much though. Platoons are a nice idea to mix things up, but good coaches will always have their opponent well scouted and have their kids prepared for such moves. It is very obvious that when Coach K platoons, he has two completely different squads. The Okafor anchored squad will keep the opposition on more of an alert because of his varied skills, from shooting to dishing. “Jah” facilitates the shooters. “PlumTree” #3 not so much, even though he has an impressive increasing skill set. As for the others, I think they are interchangeable to a greater or lesser extent. So Substitutions based on foul trouble, nightly performance, injuries (God forbid), etc. will be helped by this depth. My wish would be to see Coach K break from his traditional 7-8 deep rotation, and use each and every one of his 10 scholarship players. Who do you prefer as the starters ??? I have no issues with the current starters of Quinn Cook, Tyus Jones, Jahlil Okafor, Amile Jefferson and Justice Winslow. I would prefer to see Sulaimon as the starting “2” Guard because I like his defence. Even Coach K has admitted that Sulaimon “applies the best ball pressure” on the team. Also, Cook always plays well, mostly against weaker teams especially in November and December, but we will see if that changes this season. There present Starters are fine with me. I like Rasheed being the firm 6th Man, ready to step in, or being swapped into the Starter’s spot for an especially adroit opponent for the night. I worry about Quinn’s ability to maintain his level of concentration when things go askew, like his shooting. I have already noticed that he still does not shoot well with a Defender in his face. All of his Trifectas have been gorgeous, but they were hardly contested. Amile gave up his Starting position quickly in Game #1 to foul trouble. He corrected his mistakes in Game #2. A good sign, but he will surely need to stay out of foul trouble to be most effective. If not, the “look” of the squad is forced to change depending on who Coach K decides is his best Sub. Which player impressed the most ??? Coming into this game, Justice Winslow was hailed as a shaky shooter, but he has shown that he can knock down the open Three Pointer (he is 3-of-5 at the moment) and mixes it up nicely by driving to the hoop, finishing with or without contact, however, the most impressive was Jahlil Okafor. I have a feeling that he hasn’t even scratched the surface on his potential. Fairfield and Presbyterian were so worried about the big Freshman, Duke was getting open looks from the Three Point Line. Shucks, Mate … You stole my 1st Choice, so I will only add that I saw a guy who was a wonderful blend of Kyle, Lance, Shane, and Grant. The sky is the limit for him. I doubt if many teams have answer for his versatility on both ends of the Court. As a rule, I rarely see incoming Frosh, so to state the obvious that everyone else forecast, Jahlil Okafor is the real-deal and a very special player. His personal link with Tyus will pay plenty of premiums all season long. Did any other player stand out in a less obvious way ??? I love the composure of Tyus Jones, he probably didn’t stand out as much as the other Freshmen, but he scored 21 points and dished out a dozen Assists in his first two collegiate games. He registered three Turnovers. One was a steal he lost due to being out of bounds. The other was a great pass that missed it’s sleeping target on the baseline. I was happy to see Matt Jones shoot the way everyone expected him to coming in last year. I think he was put in a different role last year. He will be called on to balance the shooting attack giving nothing away on the defensive side. The same could be said for Semi, except that he saw such little action last year that I joked that I never needed to learn how to spell his surname. That won’t happen this year. He ought to get minutes this year and prove he deserves them. What is your prediction for the Michigan State game ??? When two legends meet it is always a very good game. If Duke wants to win this they have to let Okafor touch the ball on Offense all the time. That’s their best point of attack. Tom Izzo has gotten more teams to the Final Four than anyone else. That’s because his teams always play tough with purpose and focus. This year they come in with a paltry #19 ranking in both Polls, without the familiar names of the past four (4) years. Worry not, as I expect they will still prove a formidable test to the defensive mettle of Duke. This will be an excellent test for the Frosh, who will then get a few more tests later in the week in Brooklyn, but don’t look past the Spartans, boys !!! Today, we begin a periodic installment here at Simply Duke Basketball. We call it “Point – Counter-Point” after the many great TV and radio shows that have entertained a thoughtful debate about the topics of the day. Now Bermuda Bob and Ro Shiell step up and apply the idea to Duke Basketball as the season formally begins. Can Platoons work for Duke this season ??? Do you think Coach K will use them ??? Platoons won’t work because this team needs Okafor to be on the court for as long as possible if he is going to live up to his Pre-Season Player of the Year nomination! 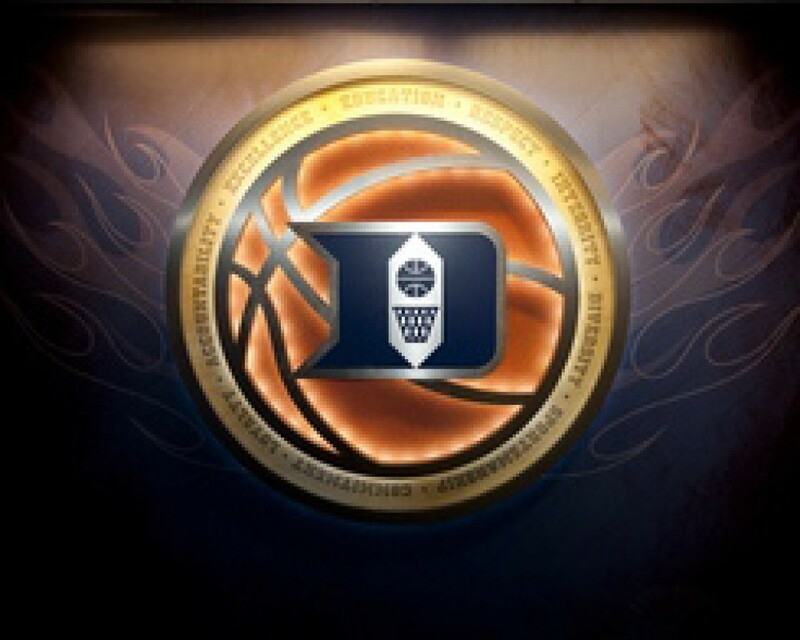 Who do you think is Duke’s X-Factor Player for the coming season and why ??? An X-factor is described as a variable in a given situation that can have the most significant impact on an outcome. In all the pre-season hype, we know what the Freshman, three of them currently included in CBS Sports Top 100 players, are expected to bring to the table. Quinn Cook, Amile Jefferson, Rasheed Sulaimon, and maybe Matt Jones, are all known quantities. Therefore, my X-Factor can be one of two players. They both have qualities that, if exploited properly, will make Duke a much better team. Marshall Plumlee brings size to the equation and Semi Ojeleye shot 57% of his Field Goal Attempts and 90% of his Free Throws, in limited minutes, last season. The ceiling is very low for these two guys who, more than likely, will be marginalized in the coming season. If Plumlee can either pair with Okafor, or back him up effectively, and if Semi can prove that his scoring numbers weren’t a fluke, then Duke will be a much better team. If an “X-Factor” is the pivotal person, I’d say it was Okafor, but if you’re looking for a guy who has changed his game to best serve the team, I’d say it was Amile. He has been adjusting to his body and his incredible wingspan since coming to Duke, but has gotten into Foul trouble often. If he can control everything, he will be the team’s X-Factor. Is Coach K trying to compete with John Calipari ??? They are two big fish in the same little pond. They are trying to recruit the same players and they are trying to win the NCAA Tournament on an annual basis. So, in that sense, there is some competition. All D-1 coaches are competing against each other in some way. Having said that, I don’t think Coach K wakes up every morning and works out to “Eye of the Tiger” with Calipari in mind! It’s not on that level for him. On the other hand, I do think that Calipari does set out to challenge Coach K. If you are building a legacy you have to go through the guy who has already established himself. What is Duke’s biggest weakness going into the season ??? Defense. Sure, they are generally a “new” team but as Mike Tyson famously says, “… everyone has a plan until they get punched in the face.” I want to see this Defense under pressure before I can rule it out. Plus, you can’t discount the fact that the backbone of this team couldn’t get a stop against Mercer in the last NCAA Tournament. The Front Court has many questions because it is anchored by a guy who fouled out of one of his most anticipated high school games – against, Cliff Alexander. Added to that, with Okafor being lauded as a “dominant force,” one can imagine many an opponent’s game plan would be to attack him offensively. That is not to mention the disparity between the Block/Charge on the other end that young big men have to face. If that succeeds then Duke is stuck with Jefferson and Plumlee, two players who are magnets for Fouls themselves. All this boils down to is that the traditional man-to-man defense might be a struggle. I do not see a weakness right now because Duke is deep at all positions. They all seem to have accepted Coach K’s vision for each of them, so, it’s a matter of how he uses them. Otherwise, it’s execution, reaction, and how they evolve together. What do you think is Duke’s biggest strength ??? Depth in the Back Court. There isn’t much difference between Sulaimon, Matt Jones, Quinn Cook, Tyus Jones and Grayson Allen. When you add Semi Ojeleye, and to some extent Justice Winslow, to the mix, things get very interesting. Coach K has admitted: that “You can’t compare him (Okafor) to anyone in the past … maybe Elton Brand, but he’s bigger.” The real question is if Coach K can coach a player with as many dimensions. Can Rasheed Sulaimon return to his previous form ??? Sulaimon had a strong Freshman season and played well sporadically last season. Who remembers that shot to send the Syracuse game into overtime? At this point, we must conclude that he serves Duke playing big minutes from start to finish. Will he start this season ? Now that is the million-dollar question. I certainly hope so. I never quite understood what Coach K was doing with him last season, but, as the Syracuse game proved, he is capable … It really breaks down to the question of if Coach K gets him playing time. Final Four, Elite 8, or somewhere else ??? This Duke team is very balanced and if they can play as a team, no one player taking on too much, then they have a shot at redemption for last season. Barring injuries, Duke could win the ACC and be a Final Four team. I think we will have a better idea in December as they are on the cusp of the conference season. Have you got a question you’d like us to tackle for our next installment ??? Want to add your thoughts to what we’ve discussed here ??? Please drop us a line here and we will include it in the next round. 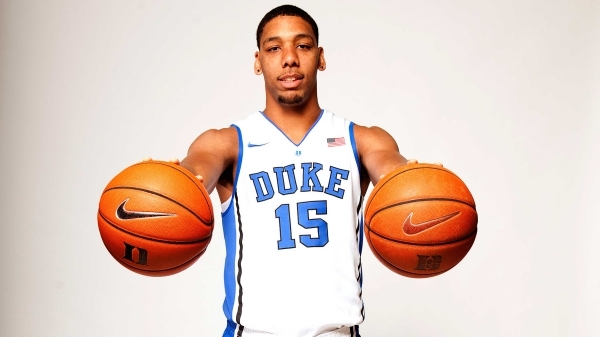 Jahlil Okafor – Could Duke’s Newest SuperStar Be A Big Man ??? All across the south, sports fans are still enjoying college football. There is even an excitement in Durham as the Blue Devils are ranked #20 in the new playoff poll. However, IT IS NOVEMBER ! The leaves have changed colors, deer hunters are in their stands, and there is a brisk chill in the air. As basketball season quickly approaches, Duke is again everyone’s favorite team to hate. Already tabbed as the ACC favorite, a potential Player of the Year could be the person to save the day. Suiting up in the same blue and white, this guy looks very different than the typical Blue Devil. The school that is often referred to as “Point Guard U” will rely on something different. Someone with back to the basket ability, and the ability to turn heads all year round. No, it is not Bigfoot, it is not the “Boogie Man,” it is a power house that will look to lead this team to the Final Four. Possibly the most motivated man in America ready to hit the hard wood, Jahil Okafor is a beast. Already ear-marked as CBSSports Preseason Player of the Year, he is the best big man to step onto campus in some time. Don’t think he wants it ? He has already stated that he wants to break all of Jabari Parker’s records from last year. In other words, Jabari was great, but Jahlil wants to be better. If you could describe him in one word, it would be dominant. While participating in the annual Blue and White game he was unstoppable ! 12 of 14 shooting, he simply dominated. He appeared to be a man amongst boys, and many are hoping this is a precursor to the year ahead. Duke is known for the “Three Ball.” “Jah” should open things up and could result in a ton of points. This is going to be a rare team of experience, seniority, and talent. Having two very good Point Guards will help out, but as they put the ball into the Post, he will be able to dish it back out for good shots. One thing that Coach K and the staff may do is play more guys. Having the best recruiting class with the best player is a great problem to have. They have guys everywhere that can play. Jabari Parker scored a total of 670 points last season. That is 108 more than the second leader scorer in Rodney Hood. Parker led the team with 306 total rebounds, 66 more than the second leading rebounder in Amile Jefferson. Jabari also led the team with 43 blocks, 23 ahead of Amile. So what do all of these random stats mean ? Jabari left huge shoes to fill at Duke. The best part, Jabari may have played big, but he wasn’t a true back-to-the-basket Center. Jahlil is not Jabari, not even close ! However, the difference will be okay as Okafor will remind everyone what it was like with a dominant big man roaming the Duke Blue paint.